Resolving issue with Ubuntu installation getting stuck at VMware tools installation. I was installing Ubuntu 12.04 LTS on VMware. I used the "Easy Mode" option while installation. When I finish the installation, the VMware automatically tried to install VMware Tools and it was stuck. No graphical interface could be loaded. Restarting the VM and rebooting Ubuntu did not help. graphical environment to launch. Thank you. And then simply reboot your machine. You should see graphical interface coming up now. But this also leds to another problem. This does not install your vmware tools. On trying you would get the following error. 4. Make a note of the current settings for this device, then click Remove. 6. Select CD/DVD, and click Next. 7. Select the settings you noted previously (or you can set them later), and click Next > Finish. 9. Make a note of the current settings for this device, then click Remove. 11. Select Floppy, and click Next. 12. Select the settings you noted previously (or you can set them later), and click Next > Finish. 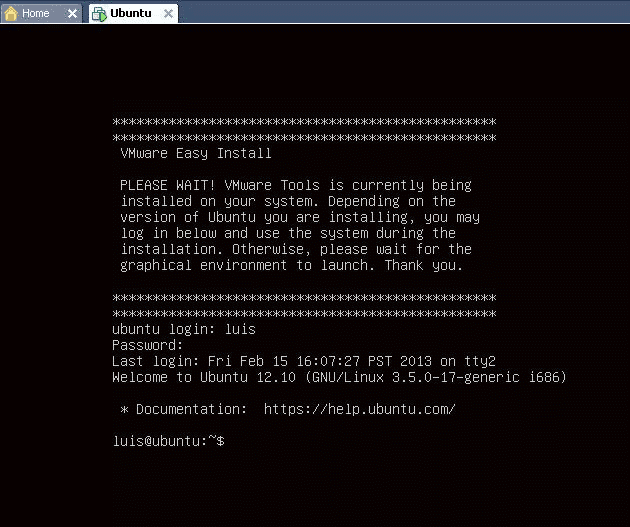 13.Power on the virtual machine and install VMware Tools. This should install vmware tools. Note : To install the vmware tools if you get popup saying CD is read only don't worry. Copy the tar.gz file to your home folder. Extract folder contents using tar -xvf filename and then install it. There is a python script in the extracted folder (ends with extension .py). Simply run it sudo ./filename.py and your vmware tools should get installed.